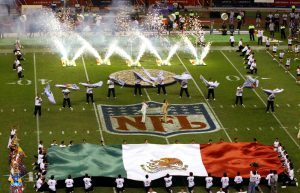 Well one thing is clear, we send the best to Mexico; I don’t think this was planned, but Monday Night’s Football game at the Azteca Stadium in Mexico City, has turned out to be the best game of week 11, it also marks the first time a Monday Night Football game has been played outside of the US. Going into this game the Houston Texans are 6-3 making them the leaders of the ACF South, while the Oakland Raiders are 7-2 placing them in a virtual tie with the Chiefs in the AFC West. The Texans are coming off a narrow win against the Jacksonville Jaguars, although a win is a win, I think everyone was expecting more of the Texans, especially against a low-ranking team like the Jaguars. Houston’s quarterback Brock Osweiler threw for two touchdowns but failed to reach 100 passing yards, he only managed to complete 14 out of 27 passing attempts, Osweiler is not considered an elite quarterback by any standard, he is ranked 29th in completion percentage and dead last in yards per pass attempts, but to be fair, at least he did not throw any interceptions in that game. Per AceSportsbook.com, the Oakland Raiders are the favorites in this game laying 6 points. There is one twist in this game and that is altitude, the Azteca Stadium in Mexico City is at an altitude of 2000 feet, much higher than Denver’s Mile High Stadium and this could be a factor for both teams. Analyzing the match up, there is no question that Oakland is the better team, Houston does not perform well on the road they are 1-3 and much less at high altitude stadiums, they lost to the Broncos in week 7 27-9. Oakland on the other hand are 5-0 on the road. Oakland is averaging 27.2 points per game while only allowing 24.8, the Texans however, are only putting up an average of 17.9 points per game while allowing 20.9 points per contest. Now, the Raiders weak point is their pass defense, but the one good thing here is that the Texans do not have an offense that could take advantage of this, however, they have been known to struggle with their run defense as well and that is where the Texans could edge an advantage is the Raiders are not in top form. What remains to be seen is how well will the Raiders offense perform, so far, this year Derek Carr and his unit have been exceptional and they are coming off their bye week, so not only have they had time to rest and plan a game strategy against the Texans they have also not lost the game following their bye week since 2011. The Raiders defeated the Broncos by 10 points two weeks ago, and although they are normally considered more of a pass-oriented team they gained 218 rushing yards on the Broncos defense, Derek Carr only threw 184 yards in that game which proves that Oakland can successfully move the ball down the field either way.